In a large bowl, beat egg with a fork. Mix chopped onion, ground beef, bread crumbs, oregano, basil, and garlic powder into the egg using your clean hands. Knead meat mixture until well blended. Form meat mixture into 48 small balls, about an inch or an inch and a half across. 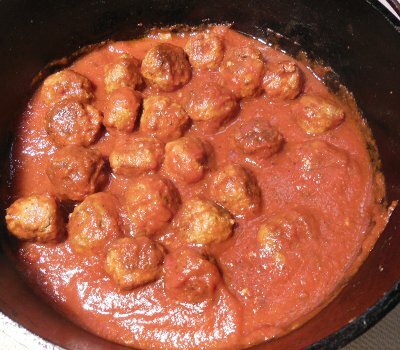 Place meatballs in a single layer in the dutch oven over coals and Fry at about 375 degrees until well browned, about 10 to 15 minutes. Pour spaghetti sauce over meatballs and stir once to mix. Put lid on the dutch oven and Simmer at about 225 degrees until the sauce is steaming. Serve 3 meatballs and sauce with cheese sprinkled on top, inside each sliced roll. You might split each meatball so it doesn't roll out of the bun too easily. Let me know how you enjoyed your Meatball Subs!